Remember during the recent Presidential debate when Mitt Romney stated the following, “Mr President, you just don’t pick winners and losers, you pick losers VIDEO).“ Well, Obama has done it again, this time it is a Michigan battery plant that was given $150 million of tax payer dollars at the Compact Power plant as workers are placed on a rotating furlough. From Fox News comes the following, ‘Plant that got $150M in taxpayer money to make Volt batteries furloughs workers’. As the Lonely Conservative opines, remember when Obama was touting that “green energy” jobs boom? Consider that among many of Obama’s 2008 promises to fix the economy in the where are they now files. Chris “Tingle Up My Leg” Matthews continues the MSM propaganda for Barack Obama and continues to spew a false narrative of actual facts that existed prior to Obama coming into office. Matthews stated that the unemployment rate was over 10% and skyrocketing. Really, over 10%? Interestingly enough the facts show that the unemployment rate was 7.8% when he took office. Actually, this was the lowest that the unemployment rate has been during the Obama Presidency as we have had 43+ months at +8%, event though Obama and his minions promised it would go below 8% after passing his trillion dollar, not shovel ready stimulus. Matthews stated that the unemployment rate was over 10% and skyrocketing when his Obamamessiah took office. That is just a false statement and intended lie to put forth to the American people to deceive them. According to the US Labor Department the unemployment rate was 7.8%. So why would Tingles feel the need to lie? Obviously, the MSM has to aid Obama to get reelected despite Obama’s terrible economic record and failed policies to help create job growth in America. Question, how does NBC allow such a statement by Matthews to be put forth and not responded to as false? Of course this is coming from a news network that allowed the doctored and edited tape to be put forth of the George Zimmerman 911 call. But when the skewing of the news and out right lies benefit Obama, mums the word. The Lonely Conservative has more from MSNBC MSU news. UPDATE I: However, as reported at ZeroHedge.com the real Unemployment Rate hits 11.7% as spread between the reported and propaganda data hits record. Today’s reported unemployment rate: 8.1%. The reason: the labor “participation” dropped to a 31 year low 63.5% as reported earlier. Of course, this number is pure propaganda, and makes no sense for one simple reason: despite the economic collapse started in December 2007, the US civilian non-institutional population since then has grown by 186,000 people every month on average hitting an all time high of 243,566,000 in August. These people need a job, and the traditional shorthand is that at least 100,000 jobs have the be generated every month for the unemployment rate to merely stay flat, let along improve. So what does one get when one uses the long-term average of the past 30 or so years which happens to be 65.8%? One gets an unemployment number that is 45% higher than the reported 8.1%, or 11.7%. Wow, the smartest President ever could not remember what the national debt was when asked by the serious and hard nosed journalist David Letterman. When asked what the national debt was when he took office, Obama could not remember conveniently enough. A note to Barack Obama, it was approximately $10 trillion. Guess what it is now Mr. President in less than four years under your administration … +16 trillion. Talk about a convenient loss of memory? Obama goes on an entrainment show like David Letterman is unable to answer a question on the debt because it would be embarrassing to him. How’s that transparency working you you America? Barack Obama called GWB irresponsible and unpatriotic for increasing the national debt $4 trillion in 8 years. However, Obama used that same Chinese credit card and increased the national debt nearly $6 trillion in 4 years to $+16 trillion. If $4 trillion in 8 years is unpatriotic, would it be considered treason to do $5 trillion in 4 years? Hmm? Now with the Presidential election mere months away Barack Obama has basically given up and gone into full campaign mode, not that he has ever stopped doing so since he was elected in 2008. 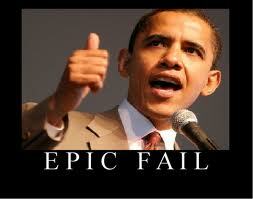 Obama has failed and as The One said in the past he had 4 years to fix the economy. If he did not, Obama would be a one term President. He has not even come close and his policies and agenda have made matters worse, not better. In his weekly podcast, Romney pounced on a recent government report, which found that the unemployment rate rose in 44 states last month. He accused Obama of blaming the “stalemate in Washington” instead of working to boost job creation. “With millions of Americans hurting like never before, the President has admitted defeat. With five months to go before his term his up, he’s saying he won’t even try anymore,” Romney claimed. The presumptive Republican nominee for president argued that he has the executive experience necessary to turn the economy around.